In any hospitality course the number one rule is to keep the customer happy, within reasonable restraints. Well duh I am not going to give you a free meal every time someone complains but on the house desserts or drinks are call for. The one thing that has stuck with me throughout this year of getting into the hospitality industry is this phase, “kill them with kindness”. You probably know this concept if you work in industry too. The basis of this theory is used when you have break bad news to a difficult customer or rowdy patron, especially concerning alcohol. Being courteous to a paying customer is a not rocket science however you can apply this to real life and use it to your advantage. Contrary to belief that nice guys finish last, I guess this is a post about how being kind and nice DOES get you places. For example, my life will be the test subject. I am not the most confrontational person; my normal reaction to any argument is to back away and let them win. Sure, this does not always work in my favor (I am talking to you lady who push me to back of the line in a meat shop). Also if you went to university like me; you would know nothing breaks the ice of a tense group project than someone bringing in a meal to share with the group (Well, you need to know the dietary requires of them but most Uni students will eat anything homemade). I hate group projects but bring in a plate of choc chip cookies does allow you to get your word in while they are using their big mouths to munch away. Even the most obnoxious student will listen to the submissive girl if you give them a cupcake. Next time any of you have a problem with someone, try being extremely nice to them. it is hard to get mad and have a reason to be mad at someone who is only nice to you. Also if they hate you, they have no reasonable proof you are being aggressive. Double Win! 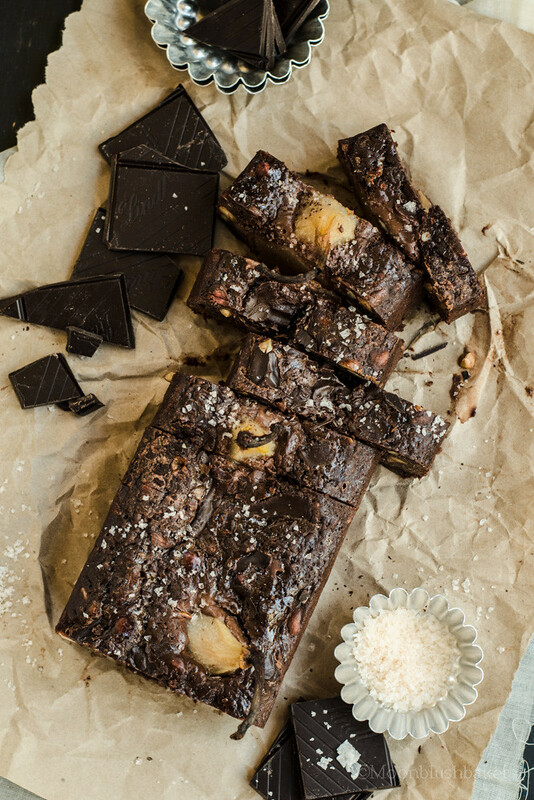 One thing that wins over people has to be brownies. 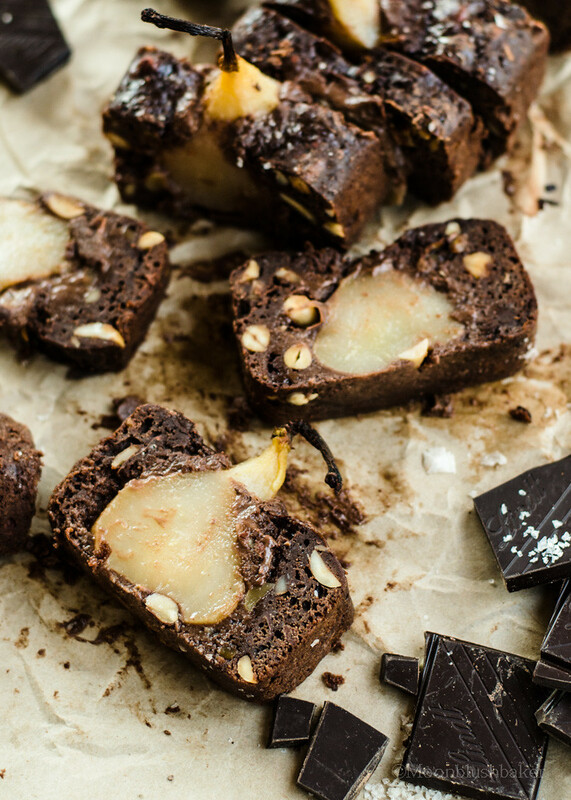 Simply anything with chocolate does this but brownies especially. I wanted to post this yesterday but something came up for a course I had to do. I am now certified to serve you booze and monitor gambling within Australia! Roll up people! 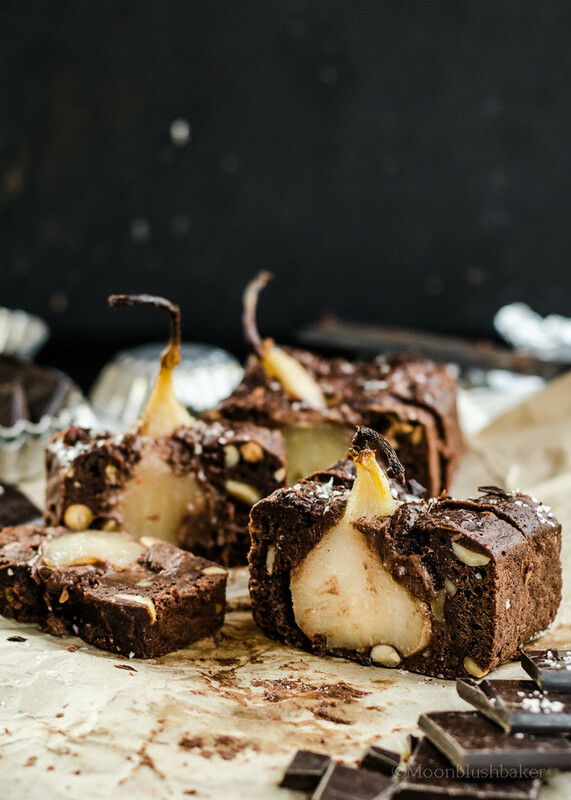 Australia is entering spring, so these are made with pears that are on brink of extinction. The reason I have these is because I forgot about them in the bottom of the fridge draw. Oh my poor organisation skills. 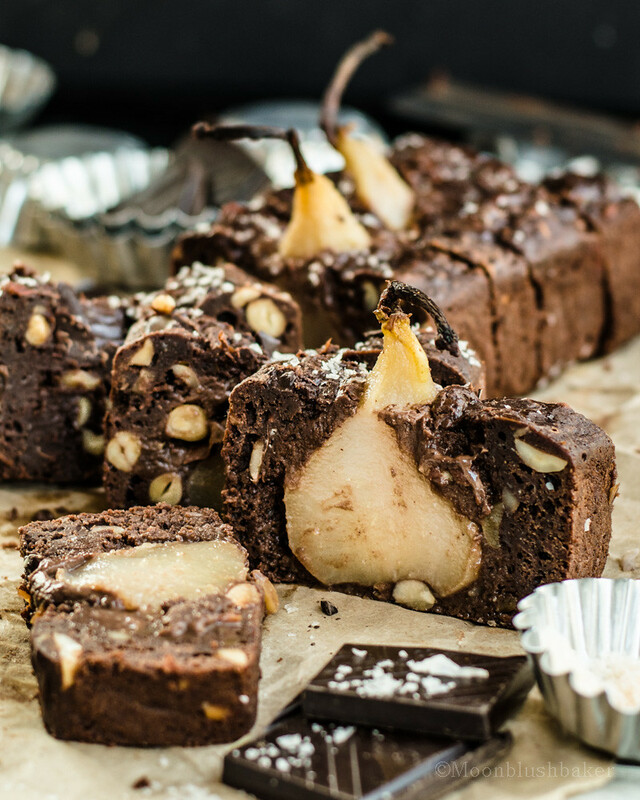 This salted dark chocolate poached pear brownie cake is the fantasy hybrid of a spoonable pudding and cake. 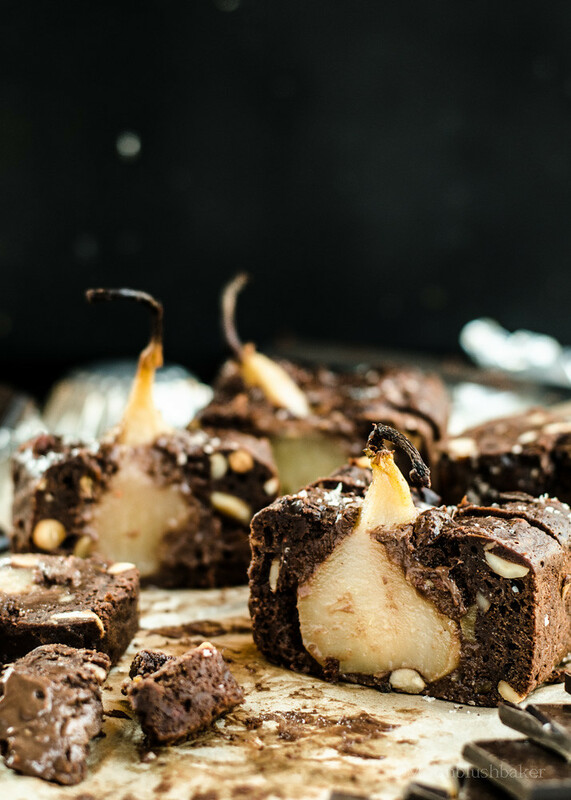 Roasted maple hazelnuts are little sweet pops against the intense dark chocolate base, which is then soften by the caramelised juices of a spice poach pear. Baked in loaf pan this a slice of this cake has the shiny, crusty top of a brownie with a pudding like center when warm. 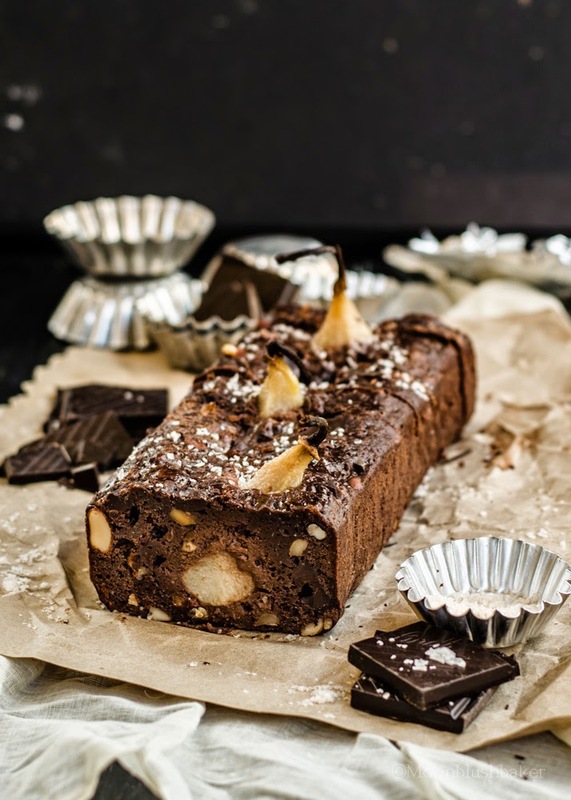 The loaf style is for convince (take it to your friends to share) but it helps keep the ratio of crunchy top to pudding molten inside just right. Depending if You are lazy baker or not you can core them but I am not bothered and I think the core is the best part to a fruit (after the skin of course). 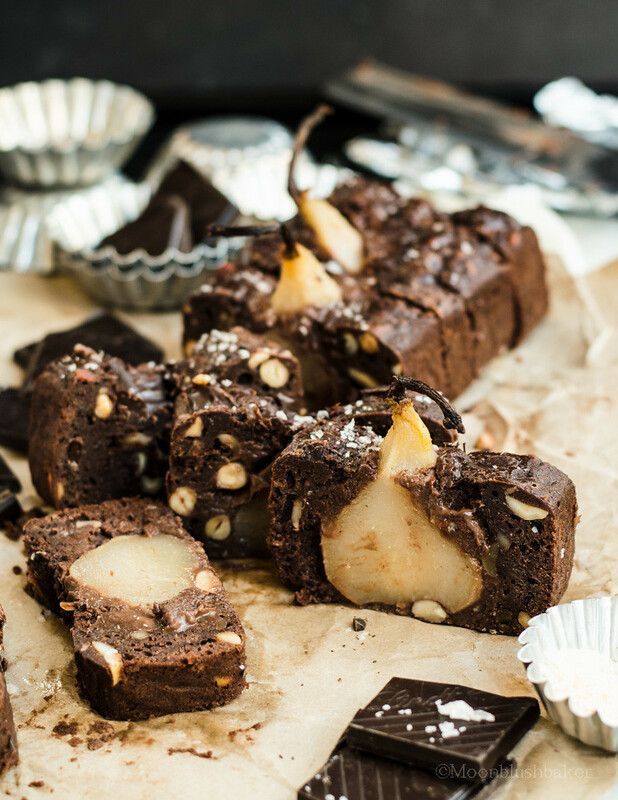 The courtesy of the poached pear recipe from the Gourmet travel which you can find here. Please go to link to find it, I changed nothing. 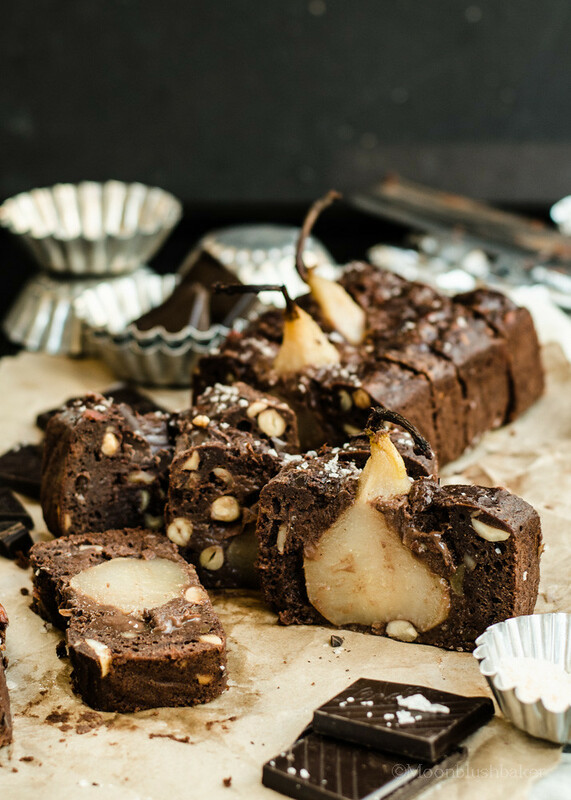 The inspiration for this actually first came from Nigella Lawson’s Chocolate sponge pear pudding but design was looking up pear and chocolate in Google images. Ahh! Google saves me again. Inspired by Nigella Express and google. Preheat oven to 180°C. Line a baking tray with baking paper. Toss hazelnuts and maple syrup in a bowl. Spread on tray and bake for 10 minutes stir half way till brown. Line a 12cm x 34cm loaf pan with baking paper, extending paper 2cm above edge of pan. Melt butter and chocolate a medium to large pot over low heat to. Cool for 10 minutes. Vigorously whisk in sugar, eggs ( ine at a time) and vanilla extract. Sift flour and cocoa over chocolate mixture. Use the whisk to fold it in to combine. Fold in hazelnuts. Set aside to cool in pan before cutting.Makes about 12. Thanks June. The world is a bit easier with sweets. Having just scoffed an entire bar of pear filled chocolate, this looks the more nourishing option. I like the way you think Nicola 🙂 Thanks Love! This looks over the top in the best way possible! I love this! Thanks Cathleen, sometimes you need slice of OTT! So my mom is in town and we both simultaneously dropped our jaws when we saw this cake. Simply stunning (and those flavors — YES)! I hope you get to make a chance to make it. I really is something to be enjoyed with such a special person like your mum. Ahh what a read and I totally agree with killing them with your kindness theory! This cake is my dream cake! I swear it has work for me so many times, that it is almost scary! Oh yes, yes and yes! Perfection. Just stumbled across your site. This is positively gorgeous! Your pictures are fantastic, as looks this recipe! !